A river rules my life – the title of a popular book hints at the prominence of New Zealand’s rivers, incising the land at every turn. Often wild and prone to flooding, they claimed the lives of many settlers. But the balance of power soon changed – farming destroyed river habitats, and grand rivers such as the Clutha were harnessed for hydroelectric schemes. For a small country, New Zealand has a lot of rivers. This is partly because there is high rainfall on its many mountains: the water flows down in streams and rivers. The longest river is the Waikato – 425 kilometres. The biggest river (by volume) is the Clutha in Otago. The total length of the country’s rivers is over 180,000 kilometres. 40 species of native fish, including eels and flounder, live in the rivers. Rivers are home to wetland and wading birds such as ducks and stilts. In the North Island’s hill country the rivers are deep and fast flowing. 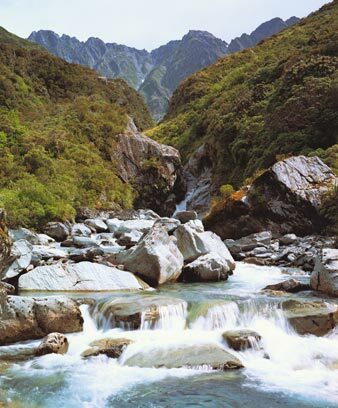 The east of the South Island is known for its wide, braided rivers such as the Wairau, Waimakariri and Rangitātā. Formed from glaciers, they fan out into many strands on gravel plains. Travelling by canoe or raft, Māori used rivers rather like roads. Rivers offered harbours, fresh water, fish and eels, and on the West Coast, the prized pounamu (greenstone). Many tribes had spiritual links to a special river. Rivers often flooded, and many early settlers drowned trying to cross them. Bridges were built, and stopbanks to control floods. From the 1940s to the 1970s, the government built dams on major rivers, to produce hydroelectricity. Some New Zealand artists, novelists and poets have been inspired by the power and beauty of rivers. The 2005 movie River queen features the Whanganui River. Land clearance for farming – silt slips into the water, along with fertiliser and animal waste. Using water for hydroelectricity schemes – water levels change, and beautiful places are spoilt. People value rivers for their beauty, for fishing and kayaking. Rivers are also important wildlife habitats. Today there is better flood control, and laws protect some rivers. Native trees are planted along river banks. But conservation groups are still working to save other rivers from harmful human activity.